IPOPI will host the third edition of the International Primary Immunodeficiencies Congress (IPIC2017) in the vibrant city of Dubai on 8-10 November 2017! Mark your calendar and ensure your attendance to learn from the best experts in the field and get the latest updates on primary immunodeficiencies clinical management advances. Dubai is the ultimate global city offering 300 worldwide flight destinations. Boasting one of the top 3 largest airports in the world and with attractive airfares from all regions, Dubai is a major connecting hub between Europe, Asia, Oceania, Latin America and the USA. It has established itself as a leading destination for international conferences including in the field of healthcare. This very welcoming and cosmopolitan city is catered for all visitors offering them an array of professional, cultural, gastronomical, entertainment and leisure experiences. The average temperature in November is 25 °C (77 °F) making it an exceptional time of the year to visit. 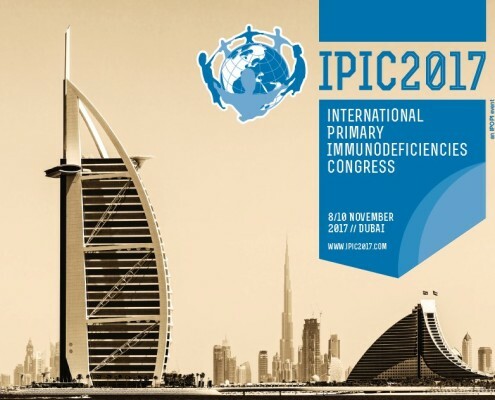 IPIC is a unique international scientific meeting focusing on the clinical management of primary immunodeficiencies. The congress has been designed to put the patient’s interest at the centre of all discussions. The uniqueness of IPIC comes from the fact that its programme is clinically orientated and prepared with the input of from the key PID stakeholders: doctors, patients and nurses. World renowned experts, nurses, patients and other PID community stakeholders will share their expertise contributing to a unique congress programme geared towards advancing primary immunodeficiencies clinical care worldwide. Stay tuned to www.ipic2017.com for more updates!